Properties for sale in Brittany, France - AHIB-3-M2189-2914969 • Huelgoat • Shop/Office premises with flat above with accommodation on two floors, also a courtyard. The location is excellent, very close to the town square. 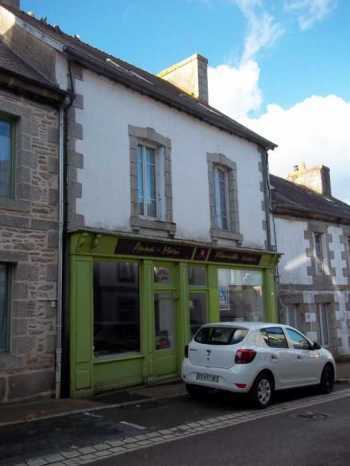 AHIB-3-M2189-2914969 • Huelgoat • Shop/Office premises with flat above with accommodation on two floors, also a courtyard. The location is excellent, very close to the town square. Huelgoat • Shop/Office premises with flat above with accommodation on two floors, also a courtyard. The location is excellent, very close to the town square. The building offers good potential as a business location. Shop/Office on the ground floor and a 4 bedroom duplex apartment above. It's connected to water, electricity and mains sewage. It will be necessary to refurbish inside, to upgrade and modernise it. On the ground floor: a massive room with large front windows facing the street (tiled floor), in the rear is a previous kitchen to renovate totally, another back room presently used as a storage area and an old bathroom with bathtub and WC to re-install and re-fit totally. An original staircase leads to the first floor where you will find two very large bedrooms with high ceilings and beams, fireplaces, and two other rooms also with fireplaces, one facing the village and lake. The whole floor needs renovation work. The whole floor will need to be renovated. To the rear of the building is a small courtyard.